There's a lot of buzz about the community experience these days. And, rightly so. We know that engaged residents who have a sense of belonging in their community are exponentially more likely to renew. However, if you've been in this industry for any length of time you know that engaging residents can be an elusive endeavor. For instance, how can two properties situated next door to each other, serving the same demographic with similar amenities have a very different 'feel'? We like to reduce it to things we can see like leadership and staffing (and those do make a difference) but I believe we are missing a key factor. The residents' own desire to engage. We know that to be true, but we often give up on our non-engagers instead of considering how we could create space for them to get involved. Often the answer does not come from the front office, it comes from relationships within the community. One way to increase engagement can be to free up connectors within your community to engage others. Our CARES Program takes advantage of this reality and meets people as fellow residents who are doing life together. We are experts in creating space for people to connect based on internal drive, not external stimulus. 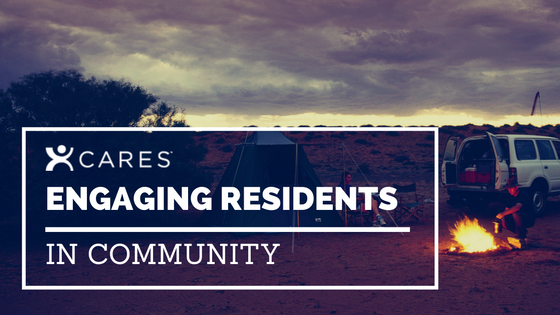 We would love to hear how you are tapping into the internal drive to engage among your residents!